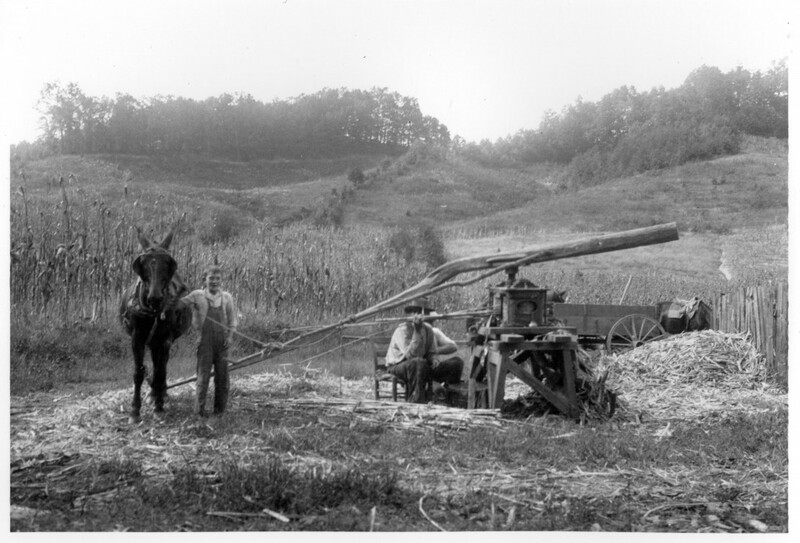 Coming up in the 80s and 90s in Central NC, there were still a few old timers around who raised and processed sorghum. Before the onset of cold weather and well before hog-killing weather set in, if you were out driving in the countryside you’d likely see mules or horses tethered to poles, turning cane mills. Unfortunately this once common tradition is now relegated to living history museums, heritage festivals, and old black and white photos. Today even an enterprising family would have difficulty processing their cane should they decide to grow it– there is only one company in the US that currently makes mills. (GrainMaker in Montana.) Vintage mills are still around though, and there are sorghum enthusiasts around the country who keep the tradition alive. This year we planted a small 10x 20 ft experimental plot of an heirloom sorghum called Sugar Drip. The seed is somewhat expensive and a bit difficult to find. Southern Exposure Seed Exchange in Virginia is my go-to source for open pollinated heritage seed. Many varieties of old-time seeds sell out early in the season, so it’s necessary to order early to get the best selection. I have fond memories of Grandpa Gaddy routinely lathering sorghum molasses on his biscuits each morning before he headed off to work. Hopefully we’ll have a jar or two bless our table this fall.